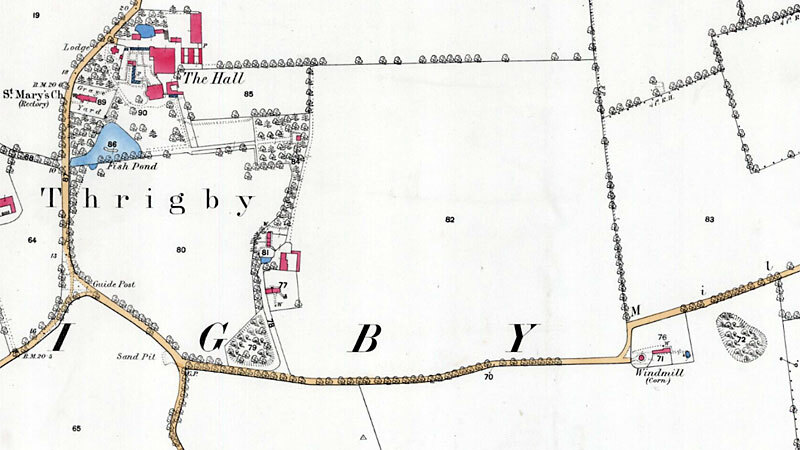 Thrigby mill was built for Robert Woolmer to grind wheat for his Thrigby Hall Estate in the 1790s and is shown on Faden's 1797 map. 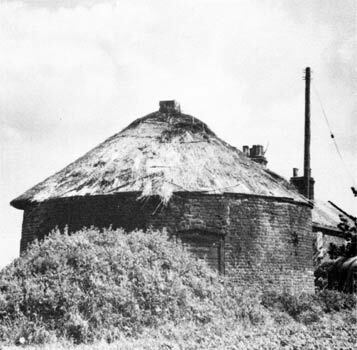 The mill had a brick roundhouse. 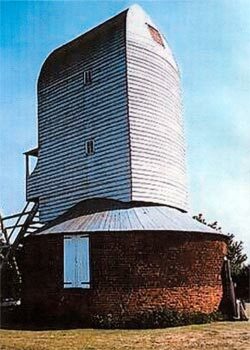 The mill was built with a 2 storey 25ft 6ins external diameter roundhouse with 6ft - 7ft internal piers. The mill buck had a porch and a tailpole and was powered by 2 patent sails and two common sails. 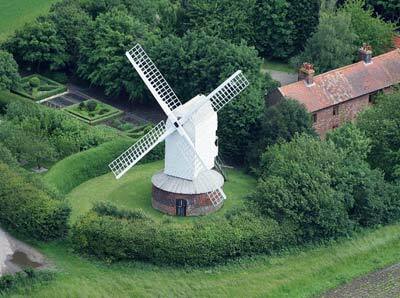 In 2008 the mill was powered by 4 common sails set on the cast iron windshaft from Tottenhill_postmill. The last tenant miller was Alfred C. Hood who was also a farmer and he ran the mill until 1889. 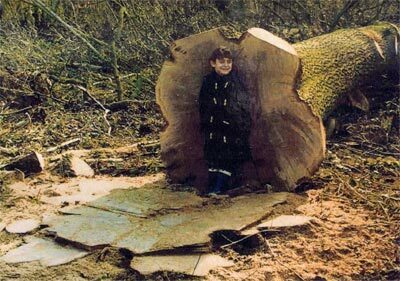 William Fowler and William Golden dismantled the mill body in 1892, which was by then infested with death watch beetle. Outside diameter 25 ft. 6 ins. Height to eaves 9 ft. 6 ins. At northwest 3 ft. square hatch being upper half of an opening from 3 ft. 6 ins. above ground level, lower half of which is now bricked up. 2 piers 4 ft. 6 ins. (from wall) by 5 ft. at base tapering to 3 ft. 6 ins. at height of 6 ft.
Lower crosstree east to west. 2 piers 5 ft. (from wall) by 5 ft. at base tapering to 3 ft. 6 ins. at height of 7 ft.
Upper crosstree north to south. Upper courses of piers not bonded to wall. Crosstrees 21 ft. long, 12 ins. square. Post at lower and 2 ft. square. Top cut off at roof and opening thatched. Ground floor sunk 15 ins. Upper floor level with top of upper crosstree. Present owner:- Mrs. D. I. 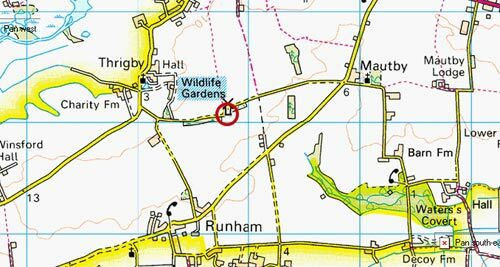 Gay, Church Farm, Mautby. 2 Mill cottages (formerly one, Mill House?) condemned and awaiting demolition. To Millers. To be Let. 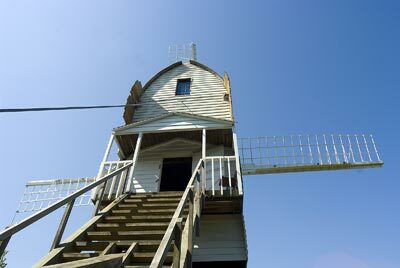 With possession at Michaelmas next A WIND MILL with a Dwelling house, stable, granary and other buildings, a garden and about one acre of arable land situate at Thrigby in Norfolk. Proposals to hire the same to be sent in writing, free of postage, to Mr. Browne at the Hall, Thrigby, on or before the 14th August next, of whom further particulars may be had. 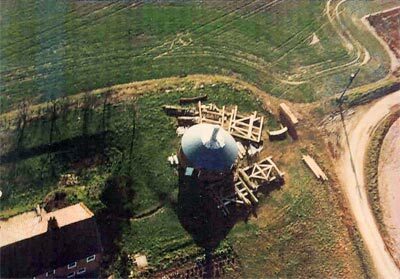 A POST WINDMILL with Roundhouse and premises all in complete repair. 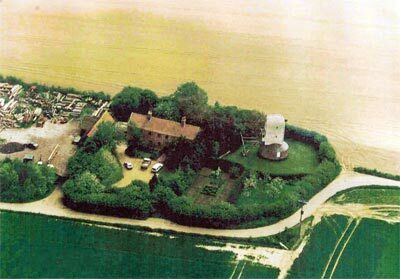 Also a comfortable Dwelling house, Garden and small quantity of LAND. Possession may be had at Midsummer next. Thrigby Mill, with good House, Garden & Land attached. Thrigby Mill, with good house, garden and small quantity of land. 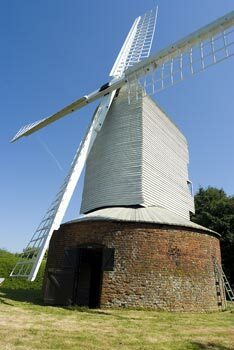 WANTED, a Single Steady YOUNG MAN to work a Tower Windmill, to live in the house and to make himself generally useful. Apply personally at Thrigby Mill near Filby, Norfolk. 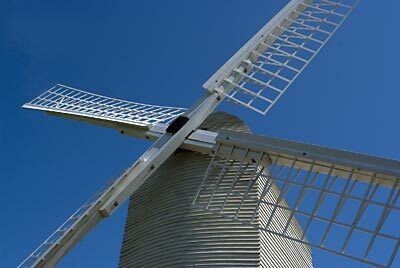 Wanted, a steady Young Man to work a POST WINDMILL and to make himself generally useful. Wanted, a Steady Young Man to Work a Post Mill and to make himself generally useful. Apply to Wm. Knights, Thrigby. accounts to Emma Knights, Thrigby, One of the Executors of the deceased. WOOLVERTON & GEORGE will Sell the FARMING STOCK for the Executor of the late Mr. William Knights. Almost 100 years later in 1981, the mill was bought by N. Prior with the intention of rebuilding the mill on the existing piers that had survived after the buck was dismantled in 1892, having been infested with deathwatch beetle. 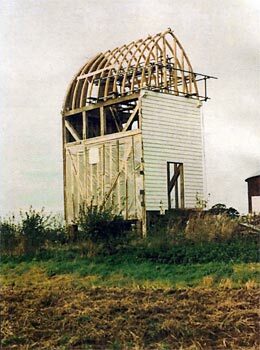 The roundhouse was repaired and the mill rebuilt and along with Garboldisham_mill became one of only two postmills remaining in the county, although as of 2004 a third mill was being built at South Walsham. Has bought property and is interested in restoring the post mill. 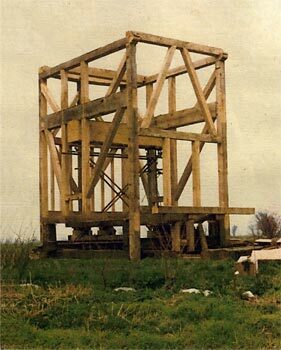 Nick Prior has built a model for reconstructing the post mill. 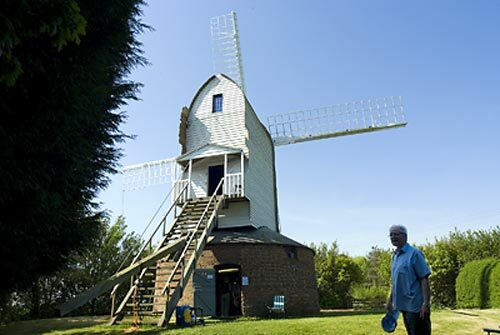 John Lawn has let him have the windshaft from Tottenhill post mill. 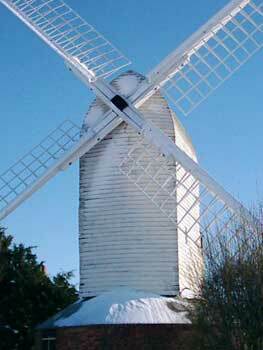 William Fowler & William Golden, Stokesby took this mill down in 1892. Beccles timber merchants Darby Brothers had an unusual job yesterday - cutting a 19 foot post for a Thrigby post mill, which is being renovated. 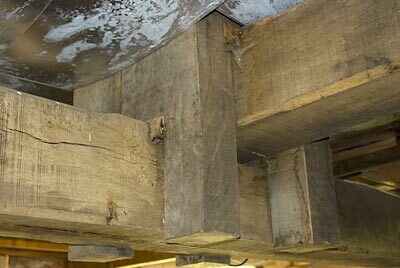 The post, which is two foot square and of English oak, will be the main supporting beam of the mill, which has been redundant since 1892. 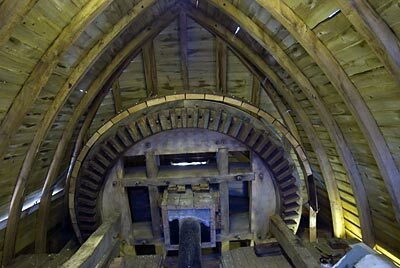 Mr. Nick Prior, who is restoring the mill, said that it was probably the first such post to be cut this century. Framework of body being assembled. 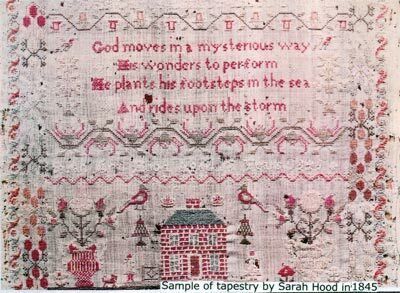 William Hood 1774 had a son Robert Hood born 1808 who was married to Rhoda Hood (née Bond) born 1812. These are the couple listed in Whites 1836 & 1841 Census as living in the mill as shown on the Thrigby mill web page (this page) site. Robert was my 3rd Great Grand Uncle. Alfred Charles Hood born 1841 was the son of William Hood 1805 and the nephew of Robert Hood 1808. He is listed as the last tenant of the mill. Alfred was my 2nd Great Grand Uncle. In the 1881 Census he is shown as living with his brother George William Hood 1837 - 1913, Georges wife Laura Hood (née Purland) born 1835 and their family. George was my 2nd Great Grandfather. 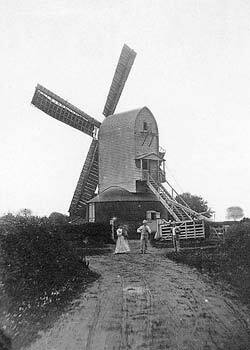 The photo that is on the website showing the mill c1880 and Alfred C. Hood and family. I think these people would probably be George William Hood 1837 - 1913 and Laura Hood 1835 I would guess that Laura is holding baby Rosina Sarah Hood born 1879. Also in the photo would be Alfred Charles Hood 1841 who as far as I can tell never married. He is shown in the 1891 Census aged 50 and all those before as being single. I believe there are details of Jack Brackenbury 1830 - 1876 - pencil marks on roundhouse roof about him joining Robert Hood at the mill on January 1st 1849. He is also listed on the 1851 Census as living at the mill as a miller servant to William Browne. Jack Brackenbury married George and Alfred's older sister Sarah Ann Hood born 1834 in Thrigby on 29th April 1855 They had a daughter M Ann Brackenbury born 1869.